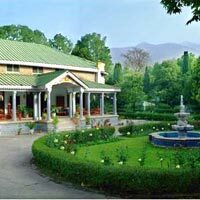 A detailed travel guide to Indian palace hotels in Himachal, heritage homes, a Himachal guide for the family and all budgets, by Vijay Verghese and more from Smart Travel Asia and Dancing Wolf Media. Himachal guide to heritage hotels in the Indian Himalayas, speeding trucks, musty palaces, some wonderful royals, and how to evade panthers in the loo. THE harsh Indian winter is the perfect time for Rajasthan and only a fool would head for the hills. Thus it was that I smiled foolishly and feebly at my family and urged them onward and higher as our ageing white Ambassador car rumbled down the historic Grand Trunk Road from Delhi bound for freezing Himachal Pradesh state, straddling the Himalayas between Kashmir to the north and China to the east. The Grand Trunk Road cuts north from the Indian capital through Haryana’s yellow mustard fields, slowly transforming into a fairly decent two-lane highway (each direction) with a verge separating traffic flow. On either side, fields flash by punctuated by village houses and roadside eateries frequented by farmers and truck drivers in colourful turbans. For toilets, use the Great Outdoors, though some restaurants may have something more civilised in the form of a tin shed and, perhaps, a bucket of water. The road verge is, of course, largely a fiction but this is, in some modern sense, a real highway. Traffic hurtles along in a blur, stopping for no man. Rules are simple. Give way to larger vehicles. Or advance at your own peril. First look at a Himachal Map to get your bearings. Stopping occasionally at the numerous dhabas (small eateries) lining the road where truck drivers rub shoulders with Delhiwallahs sporting posh accents and foreigners trying to find a decent loo – which is always a popular pastime in India – we journeyed on relying entirely on our driver’s skills, chiefly, leaning on the horn and hoping that oncoming lorry would weave away at the last minute. The best way to deal with this is to fortify yourself with some delicious mustard spinach and corn chapatis (sarson ka saag and makki ki roti). This will induce a beatific coma until, of course, your rich intake tries to find a way out and it’s time for the Great Outdoors. Help is at hand for those less inclined to rough it out. You can fly from Delhi to Kangra just 55km from Taragarh, or Kulu on Air Deccan. This cuts journey time and opens up considerable options in the higher valleys. 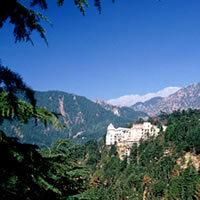 So on to heritage hotels, Himachal palace hotels and Indian hill station hideaways. To get to Nalagarh (300km from Delhi), our first stop, we drove north for five hours, turning right at Zirakpur (just before Chandigarh) towards Panchkula and the hills. From here it was an hour-and-a-half to Nalagarh via Pinjore where we turned left. Everywhere, locals we asked for directions, said it was just a furlong further left, right, straight, perhaps back and then left... We eventually got there as dusk approached. Perched high on a hill above the town in fast-closing fog, Nalagarh Heritage Resort presented a misleading CPWD-ish feel with lots of yellow wash, damp spidery patches and red brick trim. But the Central Public Works Department creations that have disfigured much of Delhi are a far cry from the restored palace that royal scion Jayatindra Singh runs today. At night as the spotlights come on the palace is transformed into a wondrous place with hidden courtyards and mysterious alcoves. There are wonderful walks along the ramparts as well as into the surrounding foothills. The original fort was built by Raja Bikram Chand in 1421 and a picturesque Diwan-i-Khas (Hall of Private Audience) was added in 1618. The Diwan-i-Khas doubles as a honeymooner photo backdrop as well as an offbeat meeting venue for 30-40 people. Nalagarh’s 19 rooms and suites are HUGE. You could swing a horse by the tail here and not encounter one of the many family portraits or photographs adorning the royal walls. The marble bathrooms have hot running water and are about as large as an average Hongkong flat. There is also an impressive array of facilities from tennis and croquet to table tennis, badminton, carom, video games and inroom movies. All the rooms feature different size, décor and style. Nalagarh serves buffet meals at fixed times which seems to work well with the patrons. Roaring bonfires at night (during winter) have everyone mingling with smiles on their faces, secure in the knowledge they have a key to a large marble toilet. Thus armed it is possible to tackle India with confidence. Taragarh Palace (530km from Delhi) at the foot of the snow-capped Dhauladhar range is a seven-hour drive from here. There are two options, via Mandi or Una. The faster route is via Nangal, Una, Amb, Ranital, Kangra and Palampur. The Mandi route is perhaps more picturesque but it takes heavier traffic and is prone to landslides. See our Himachal Map. Up to Una the road is fairly straight and unpretentious – just tractors, trucks and red-cheeked friendly people who will point everywhere if you ask for directions. Or fly from Delhi to Kangra and drive the 55km to Taragarh. Taragarh Palace is more grounds than palace, all rose gardens, swings, hammocks, manicured garden and gravelled driveway. It has a swimming pool, tennis courts and, at times, a resident Great Dane. I thought it was a pony when I first met the beast.Since my last visit this hideaway has remodelled and upgraded considerably, with the addition of a new building and a "durbar hall" for small meetings and conferences of up to 150 persons. A stunning backdrop is provided by the sharply rising Dhauldhar Range. Taragarh is cosy and a lot more compact than Nalagarh. There are 26 rooms including some suites. Some rooms are a bit of a squeeze but others are spacious with study alcoves and generous bathrooms. The obligatory tiger skins and immense portraits of strikingly handsome royals line the corridors while family silver adorns the dining room. 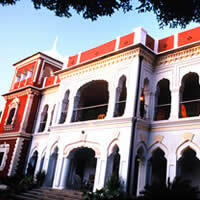 Taragarh used to be the summer palace of the Nawab of Bhawalpur who elected to cross over to Pakistan at Partition. The grounds lay vacant until the current royals (Dr Karan Singh’s family) acquired it in 1949. The hotel was launched in 1971. The dinner menu used to be scribbled on a piece of paper passed around surreptitiously like a Masonic initiation. Today things are more, well, royal. Dine at the Imperial dining hall that can manage about 50 guests. Or eat out on the sunny patio with sweeping views of the magnificent Dhauladhar Range. Later, retire, cigar in hand, to the Blue Room, clad in gleaming Burma teak. Or destress with an Ayurvedic herbal massage. Other activities at Taragarh inclue swimming, tennis, badminton, horse riding (in spring and early summer), treks and mountain excursions. Taragarh is well situated for trips to Bajinath and its stone temple and the colourful Tashijong Monastery (both nearby) or a one-and-a-half-hour drive up to the residence of the Dalai Lama at Dharamsala. See our Himachal Map. A cluttered, haphazard town, Dharamsala straddles the hills from 1,200 metres to just under 2,000m at MacLeodGanj, the highest point. The air is cleaner up here among the firs with nice views in all directions. Decent Tibetan meals can be had at Chonor House. Yes Richard Gere has apparently stayed here as well. Try the mutton or chicken mo-mos (Tibetan dumplings). 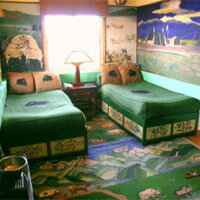 Chonor House is neat and clean with theme rooms painted by local artists. Bathrooms are modern, rooms have TV and the balconies have great views. It’s a small climb up to this place but well worth it. Each of the 11 rooms features some rather unique decor in a Tibetan theme. 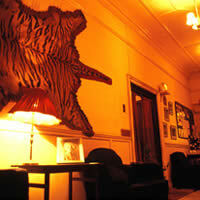 Expect a slower, welcoming pace, antiques, incense, a small library, Tibetan food, and hand-knotted carpets. Rooms have gas heaters (Italian, no less), toilets have running hot water, and housekeeping and laundery services are available from 8am-8pm every day. Chonor House is at MacLeod Ganj overlooking the Dalai Lama's temple. It is a friendly hideaway if a tad musty at times. Things will happen at a leisurely place so toss out your watch and bring along a good book. Pragpur is about halfway (driving time) between Nalagarh and Taragarh. Pragpur Village has been named a “heritage site” and it is indeed a delightful spot. There are the usual cow-dung plaster huts along with bright turquoise, ochre and white houses along cobbled streets leading to a picturesque central water tank in the village square. Prosperity has brought redevelopment but many homes sport their original brick and wonderfully carved wooden doors. Point your camera at people here and no one will assail you for a Rs20 handout. My son bought six marbles for Rs1 and the lady gave him an extra one as a gift. Try that in Singapore or New York. The marbles were destroyed within week but no matter. Get here before inflation really hits. Judge’s Court, a stately and characterful family mansion is worth a two to three-day stay to soak in the winter sun, sample some truly splendid home-cooked fare and wander the orange groves and surrounding orchards. The home oozes ambience from its burgundy façade and white archways to crackling fireplaces (in all rooms) and trees laden with mangoes, oranges and kinnus (a close relative of the orange). Winter is, surprisingly, a great time to visit. It's a time to enjoy laundered blue skies, open vistas, bracing air, and huge log fires. Judge's Court is an eco-friendly escape with milk procured from an on-site dairy, water piped from an ancient "ancestral" spring, and greens by the barrel-load straight from the garden and orchard. Built in 1918 by Justice Sir Jai Lal, the mansion was painstakingly restored two years ago to something approaching its original shine. The bonus is the new plumbing and modern bathrooms. The old house, like most others of its day, had no toilets, and calls of nature were attended to in the woods along with furry critters, some a lot less civilised and baring large probing fangs. Understandably, constipation was unknown then. Panthers ensured you were quick and to the point. Of course, should you need a prune or two Vijay Lal and his wife, both impeccable hosts, will rustle up something for you. Mrs Lal has a knack of producing culinary surprises at every meal. Her cooking itself is worth the trek here. The 11 main residence rooms are tasteful (there are a further three in a separate annexe) with ceiling fans and individual décor. Satellite television has made a belated arrival in a few rooms but, with magnificent views of the Dhauladars and a lovely lawn for a stretch with a good book, who needs CNN blood and gore? You want cow-dung plaster walls? Judge’s Court has it too. Just ask. There is also easy access to the tumbling Beas River where the sand is soft, the pebbles smooth and the blue-green waters cold. The toilets are great. Key in pocket, stride boldly forward. The exchange rate is roughly US$1 = 66 Indian Rupees. Drink boiled water, tea or coffee and beware of ice. Bottled mineral water is available in most places. Stock up. 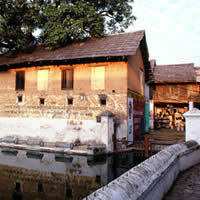 A fine online resource for comprehensive information on India holidays, travel agents and itineraries is the Tourism Ministry site www.incredibleindia.org. Try a non-airconditioned Ambassador car for a five-night, six-day circuit. Or opt for a more comfortable Toyota Jeep with aircon. Recommended circuit: Delhi-Nalagarh-Pragpur-Taragarh-Dharamsala-Delhi. There may be a small extra charge for the driver. Drivers are often accommodated at establishments en route while at others you may have to fork out Rs200-Rs500 or more for a place. You can also fly from Delhi to Chandigarh, Kulu, or Kangra, or take the Shatabdi Express train to Chandigarh. The car with driver option is the best bet for mobility. Prices are extremely affordable but there are hidden extras. Add 10 percent luxury tax on room tariff, 8 percent sales tax on food and beverage and 10 percent service charge on food and beverage. Below is a listing of the key palace hotels and contact details. Some of these can be booked through WelcomHeritage as well. This is an offshoot of the well known ITC WelcomGroup hotels. Nalagarh Heritage Resort. Contact Jatin Singh Rathi at Fort Resorts Ltd (tel:  9810827792. 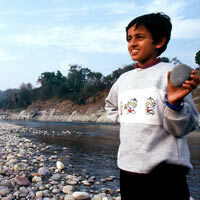 Nalagarh tel: [91-1795] 223179, 223009, fax: 223179, 223021, (e-mail: fortresorts@satyam.net.in). New Delhi tel: [91-11] 2463-4139, 2469-0741, fax: 2463-4139, (www.nalagarh.com or sales@nalagarh.com. Published rates from Rs2,700, double. Family Suite from Rs3,500. There's 50 percent off on children's meals for under-12s. Breakfast is priced at Rs225, lunch at Rs350, and dinner at Rs400. Driver's lodgings cost Rs600 per night. Taragarh Palace. 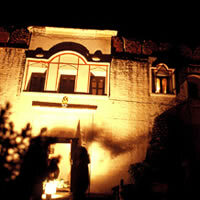 Tel: [91-1894] 242034, 243077, fax: 242034, 243077, (email: reservations@taragarh.com or www.taragarh.com). New Delhi tel: [91-11] 2464-3046. Heritage Room from Rs4,200, Suite from Rs6,000. Breakfast Rs300, lunch and dinner buffets at Rs500 each. Judge's Court. Pragpur tel: [91-1970] 245035, 245335, fax: 245335, (e-mail: eries@vsnl.com or info@judgescourt.com and www.judgescourt.com). New Delhi tel: [91-11] 2411-4135, 2411-3806, fax: 2411-5970. Single room without breakfast from Rs3,300. Breakfast Rs225, lunch Rs350 and dinner Rs375. WelcomHeritage. New Delhi tel: [91-11] 4603-5500, fax: 4603-5528, (e-mail: holidays@welcomheritagehotels.com or www.welcomheritagehotels.com). Chonor House. Tel: [91-1892] 221006, 221468, fax: 220815 (e-mail: chonorhs@norbulingka.org or www.norbulingka.org/visitors/chonor.htm). Ibex Expeditions Pvt Ltd. Award-winning outfit run by resourceful husband-and-wife team of Mandip and Anita Singh Soin, runs excellent eco tours and adventure journeys in several parts of the country. New Delhi tel: [91-11] 2691-2641, 2691-7829, 2682-8479, 5162-2922, fax: 2684-6403, (e-mail: ibex@nde.vsnl.net.in or mandipsinghsoin@hotmail.com or www.ibexexpeditions.com). Travel House. 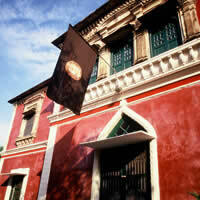 New Delhi tel: [91-11] 2601-7808, fax: 2601-4550 (www.travelhouseindia.com). TCI. New Delhi tel: [91-11] 2331-5181, fax: 2331-6705. Cosmopolitan Tours. New Delhi tel: [91-11] 2467-6631, fax: 2688-2072, (e-mail: csmopltn@del2.vsnl.net.in). Ambassador Travels. New Delhi tel: [91-11] 2334-2956, fax: 2373-2319, (e-mail: ambtrvl@ndb.vsnl.net.in).